(CNN) -- At least one member of the jury that sentenced Cameron Todd Willingham to death in the arson homicides of his three children says she is struggling with the idea that she might have convicted an innocent man. A family photo shows Cameron Todd Willingham with his wife, Stacy, and daughters Kameron, Amber and Karmon. It has been 17 years since Willingham was convicted in Texas of setting a house fire that killed his children, a crime Willingham vehemently denied right up until his execution in 2004. Since that time, three investigations have concluded arson was not the likely cause of the 1991 fire, including one that arrived in Texas Gov. Rick Perry's office 88 minutes before the scheduled execution. Perry replaced four of nine members of the Texas Forensics Sciences Commission in recent weeks, just before the commission was to receive a report from the latest of the three investigations. "I don't sleep at night because of a lot of this," Brokofsky said. "I have gone back and forth in my mind trying to think of anything that we missed. I don't like the fact that years later someone is saying maybe we made a mistake, that the facts aren't what they could've been." Brokofsky spoke with CNN by phone from her Midwest home. She has long since moved away from tiny Corsicana, Texas, where the fire took place. "I do have doubts now," she said. "I mean, we can only go with what we knew at the time, but I don't like the fact now that maybe this man was executed by our word because of evidence that is not true. It may not be true now. And I don't like the fact that I may have to face my God and explain what I did." "When you're sitting there with all those facts, there was nothing else we could see," she said. "Now I don't know. I can't tell you he's innocent, I can't say 100 percent he's guilty." Brokofsky had another revelation. She said she thought she would be excluded from the jury because of her family's close relationship with key witness and then-Corsicana Assistant Fire Chief Douglas Fogg. Her father was also a fire marshal for eight years before the Willingham fire. "I was raised with my father being a fire marshal," she said. "He went around proving that stuff, so he wasn't here at that time. But I knew Doug Fogg, who was one of the witnesses. It was no secret, but I didn't think they would pick me as a juror because of it." Critics say Perry's recent actions to shake up the commission were politically motivated, a charge he denies. Perry's office said it received a five-page fax on the day of the execution that contained an arson expert's findings that the fire was not deliberately set. It is unclear whether Perry read the fax. "Given the brevity of the report and the general counsel's familiarity with all the other facts in the case, there was ample time for the general counsel to read and analyze the report and to brief the governor on its contents," Perry spokeswoman Allison Castle said. Willingham was executed less than two hours later. Death-penalty opponents say an impartial review of Willingham's case could lead to an unprecedented admission -- that the state executed an innocent man. The latest report concluded that the arson ruling at the heart of Willingham's conviction "could not be sustained" by modern science or the standards of the time. Perry said he remains confident Willingham was guilty, as do authorities in Corsicana, south of Dallas, who prosecuted Willingham. Willingham's wife's brother, Ronnie Kuykendall, said in a signed affidavit that Stacy Willingham told her family that Todd Willingham confessed to killing the children during her visit to him on death row a few days before the execution. 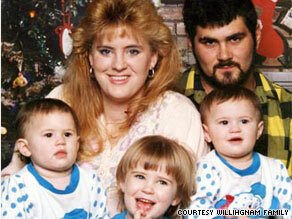 But Stacy Willingham testified for her husband during his trial, while her family argued he was guilty. CNN could not reach her for comment. Even Willingham's defense attorney, David Martin, remains confident his client committed the crime. Martin slammed the most recent report on the Willing ham case, by Maryland arson expert Craig Beyler, as "one of the least objective reports I've ever read." On Thursday, Perry also lambasted the Beyler report as having "a very politically driven agenda" and being propaganda for the anti-death penalty movement. Beyler, asked about Perry's statements, said they were "strange and clueless."